POPULAR SALEM SKETCHES RETURN WITH SIXTEEN NEW SHORTS! They’re the different elements that pull together to create the city we know as Salem. They are the different worlds that revolve around us, unique and personal, each with their own stories about where they’ve come from and where they’re going. They’re individual threads that, combined, make Salem an international destination unlike any other. Sometimes, to really notice the interesting people and things happening around us, we need someone else to point it out. Salem Film Fest co-founder Joe Cultrera understands that . It’s why he and SFF Organizer Perry Hallinan premiered SALEM SKETCHES during SFF2013. Last year’s short films were shown before all featured films, giving audiences a new view at their city, from snow plows roaring through downtown Salem late at night to the miniature world that lives in the basement of a local model train enthusiast. The SKETCHES, which were shown in a mixed manner so audiences wouldn’t know which one they’d see ahead of the featured film, became one of SFF’s most popular features. Eager to continue the cinematic exploration of Salem at SFF2014, Cultrera has pulled together an illustrious group of local and visiting filmmakers to capture more moments in this year’s SALEM SKETCHES. The resulting compilation is sixteen short vignettes that shine new light on local people and businesses, set to a soundtrack provided by local musicians. It makes SFF a very active partner with the local community, Cultrera said. More than a dozen filmmakers went out into the city over the past few months with a camera and instructions to create a short film about something they found interesting and unique in Salem. Many of the filmmakers, hand chosen by Cultrera, were Salem residents with little to no filmmaking experience. Many of the students at Salem’s The Phoenix School had never seen a professional camera before Cultrera arrived with the idea to give children a camera and see what they do with it. Cultrera and his new pint-sized crew ended up at Harrison Comics, the comic book store on Essex Street that has been a local refuge for youths and adults alike for years. 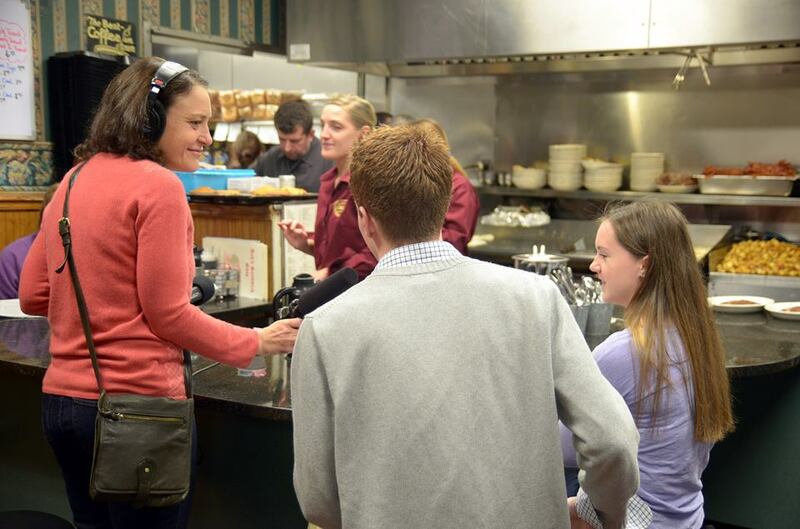 The students quickly fell into different roles – director, producer, boom mic operator, camera technician – and the resulting short surprised Cultrera, a film industry veteran. “It’s great! 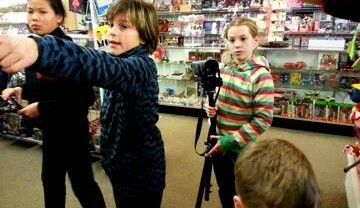 The kids had a lot of fun and shot a really cool film. I’m excited to hear what people think,” Cultrera said. This year’s SALEM SKETCHES also include films by John Andrews, Beth Balaban, Kevin Belli, Kevin Brunswick, Laura Corwin, Joe Cultera, Lucas Custer, Henry Ferrini, Perry Hallinan, Chip Van Dyke, and Hugh Walsh. Subjects include ” bingo, breakfast, bubbles, candy, mattresses, puppies, records, sewage treatment, shoes, swimming, trains and more”. When Bari Pearlman received her invitation to make one of the SKETCHES that will be featured at SFF2014, she did not hesitate to answer. The New York-based filmmaker is no stranger to Salem Film Fest. Pearlman’s films (SMILE TIL IT HURTS, DAUGHTERS OF WISDOM, NANGCHEN SHORTS) have appeared at SFF on three separate occasions (a SFF record), and her frequent trips to the festival have made her a fan of both the local filmmaking community and the city in general. ” Making shorts about Salem is especially exciting because it’s a way to make a sort of a love letter for a place that has been so welcoming of me and my work,” Pearlman said. It was Pearlman’s past SFF experiences that guided her own idea for her short when she rolled into town in January with fellow SFF alum Ezra Bookstein to begin shooting. For Pearlman, Bookstein, and the Phoenix School students, the subjects came about rather easily. For others filmmakers, the experience was a bit more similar to other film shoots, where things happen and the story you expected to get turns into something completely different. Cultrera likes to mention several filmmaker friends of his who came up from Boston to shoot a vignette near the North Street bridge. When Kevin Belli, Beth Balaban and Kevin Brunswick arrived at the location, they were unable to gain access to the subject of their original idea. Downtrodden, they were preparing to leave when they strike up a conversation with one of the neighbors in the area. 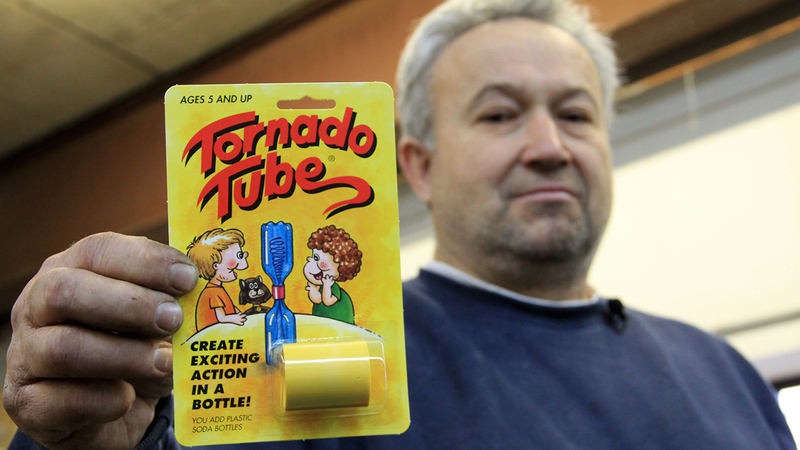 That neighbor turned out to be Craig Burnham, inventor of the Tornado Tube. For anyone whose sat through a third grade science class in the past twenty years, the Tornado Tube is a very familiar science toy. 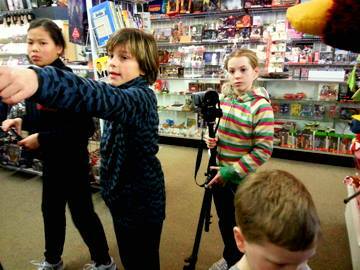 The filmmakers quickly realized the story they had stumbled upon and began shooting. Cultrera says the resulting short is a perfect example of the SALEM SKETCHES. ” [SALEM SKETCHES] is a visual cross-dialogue that – in the process – creates a better understanding of what documentary can be, the many forms it can take, and how you can find a story behind any door you pass,” Cultrera noted. Cultrera is excited by the filmmakers’ enthusiasm for what he likes to call SFF’s “filmmakers-in-residencies” program. “[It’s] something we haven’t seen at other festivals and we expect to grow it each year,” Cultrera said. How big SALEM SKETCHES grows is yet to be seen, but whether or not there will be stories in Salem for filmmakers to capture is easy to answer. Various SALEM SKETCHES will premiere before each featured film at SFF2014. A full screening of all SALEM SKETCHES will precede the world premiere of KASHEER on Saturday, March 8 at 2pm in the National Parks Visitor Center.